Whether you need particle counts across hundreds of samples or a deep dive into a single sample, MFI software has the analysis capabilities you need. Particle analysis can feel like finding a needle in a haystack, especially when you’re dealing with subvisible particles. Fortunately, our MFI™ series has the analytical software to handle the collected data. 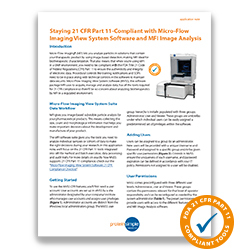 MFI Image Analysis gives you insight into your particle populations, and MFI View System Suite (MVSS) provides you with a dynamic toolset for high-throughput data analysis and 21 CFR Part 11 compliance. 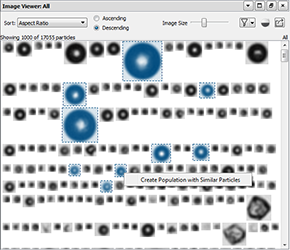 MFI Image Analysis gives you the data visualization tools to differentiate your particle populations. 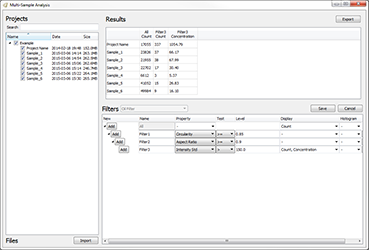 Seamlessly integrated with our MVSS software, MFI Image Analysis is a brand-new suite of analytics that enables users to view and sort images captured by MFI, design filters based on those images and then verify those filters are capturing the right particles for your application. The MVSS Multi-Sample Analysis tool gives you the ability to look at trends across your sample cohorts. It seamlessly integrates with MFI Image Analysis to apply the custom filters you’ve developed for the samples you need to analyze. MVSS has all the tools required for 21 CFR Part 11 compliance, meaning that if you’re using MFI in a GMP environment, you can be ensured of the authenticity and integrity of your electronic data. Check out our application note to learn more about the 21 CFR Part 11 tools that are in MVSS. For additional details on how MVSS supports 21 CFR Part 11 compliance, see also our handy Compliance Checklist. MFI Image Analysis software is available to demo for 60 days. MFI Image Analysis can be directly integrated with MVSS 5.0 or higher on the MFI instrument computer or used as a standalone program on a personal computer. Contact Technical Support to upgrade to MVSS 5.0 and demo MFI Image Analysis or request a quote to purchase single or site licenses for MFI Image Analysis Software.